I’m a fashion fanatic, but honestly there are times when jeans and a tee are all I can muster. I love color, but can’t always get it together to apply makeup before my day has to begin. 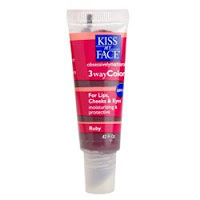 Enter Kiss My Face’s 3-Way Color for lips, cheeks and eyes. Whether you are a bride-to-be, a working or a stay at home mom, a busy college student or just a low-maintainance kind of girl, this little tube of sheer natural color is the one makeup tool you won’t want to leave home without. It’s no secret that I love KMF face products, but it was my newly formed gym habit that finally convinced me of this particular product’s charms. After my post-workout shower I no longer look clean yet extremely over-taxed and exhausted. “Ruby” is my color of choice, and with just a few swipes and some blending…my eyes are brighter, my cheeks glow and my lips look naturally flushed. Simple AND pretty. I love it when a plan comes together! 3-Way Color is scented with truly yummy natural fruit flavors (pink grapefruit, pomegranate, raspberry and white grape for example!) and is formulated with olive and mango butter. It’s gentle on skin (I can attest to that. My skin is highly ornery!) and I love that it comes equipped with an all natural sunscreen (Titanium Dioxide) as well. I was surprised that this color works as well on my eyes as it does my lips and cheeks, but it’s versatility makes it just right for creating custom looks. It doesn’t always last long on my eyes, but that’s easily remedied with primer and I’m not looking for long-term here. I just want to get me and my preschoolers from the gym to the house as quickly and happily as possible. And if we can do it with me not looking like death warmed over…even better! Kisses to everyone over in gorgeous Gardiner at Kiss My Face! 7 Responses to "Color on the Run!" OK, I am intrigued. I will have to go and investigate at the store this morning after I go to the post office. You put it all over your face and eyes? Sounds simple enough. Does it come in different shades because I have very freckly skin. This could be the answer to my ever shrinking me-time. Okay, the last two posts are going to make me spend money! Kisses to you from Gardiner- thanks so much for mentioning us! Our 3Way Color comes in 4 shades and can be used to accent the eyes, to give your cheeks a bit of sheer color or on the lips. If you’re looking for more “all over” coverage, try our Tinted Moisturizers (in 6 tints). Feel free to pass this code along to your readers for a 25 % discount on online purchases of these and all our other great products until August 7. KMFBLOG3 Enjoy! Thanks all for your comments! And thanks to Heather for sharing a discount code. I’ll be sure to use it on a couple of the products I can’t find locally on store shelves. I can’t even tell you how thrilled my husband is that our local Wegman’s carries the KMF Aloe Vera toothpaste! Awesome! Thanks for the discount code too…can’t wait for my items to arrive now, thanks for the tip Erin! Erin — you are a born saleswoman. It’s on my “must have” list and will make its way into my emergency kit! Candace…your comment made my day!